I failed to complete the 2018 Goodreads Reading challenge. 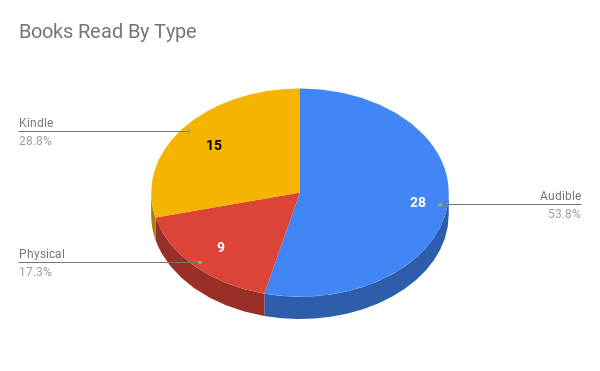 I set out to read 60 books after reading 55 last year and 65 the year prior. As of last night, here are my numbers, in convenient picture form, snipped from the official Goodreads page. If you want to see the rest of the official tabulation in all its glory, have a look at the Goodreads summary. Was glad to finish that many! As is my common practice, I exported my Goodreads library to do some custom analytics. I tend to verify the numbers that Goodreads calculates to make sure I haven't done something silly. This year, Goodreads put my page count ahead and my book count behind those produced by culling through the exported data. My calculated tally was 19,898 pages across 52 books. Close enough, I suppose. The longest and shortest books were accurate this year, although, since my page count was slightly lower than theirs, and with an extra book besides, my average length was lower: 383 pages. Oathbringer... was a lengthy book. Let's have a look at longest three and shortest three, beginning with the longest! The largest three books I read last year totalled 2792 pages. This year's total is a whopping 3091 pages. Now for the shortest three. The smallest three books from last year totalled 295 pages. This year's total is considerably smaller at 176 pages. Notably, none of the small books this year are either poetry or philosophy. I did read Paradise Lost, by John Milton, which is a ridiculous 453 pages long. I think that makes up for it, although a year without Robert Frost is probably a year with some time less well spent. This year's median book is Authority (second book in the Southern Reach Trilogy), by Jeff VanderMeer, and at 341 is slightly shorter than last year's median book length (352 pages). As an aside, I strongly recommend READING the Southern Reach trilogy (the first of which is Annihilation, on which was based a recent movie starring Natalie Portman). I haven't seen the movie, but understand that it's not as representative of the book as it could be. And the book is great. Period. Alright, on with the metrics! Now begins the data that Goodreads cares nothing about, but which are really interesting to me. 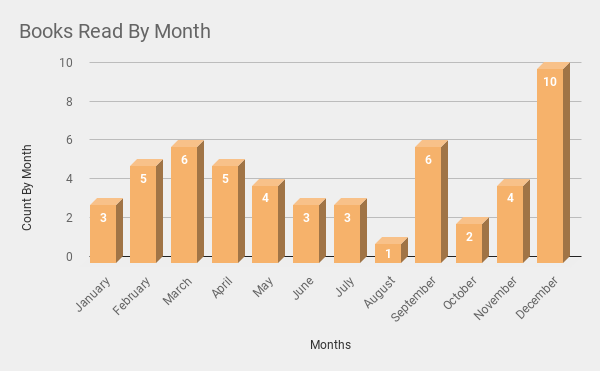 We begin with a look at how many books I completed in each month. This graph looks considerably different from last year's. First of all, this one is 3-D. Secondly, there were no months with a zero, which is good (although that August completion is pretty weak). Third, December looks LOADED. TEN BOOKS?! REALLY, DECEMBER?! The truth is that there were several short Christmas-related books I read during December (A Christmas Carol, Jacob T. Marley, The Life and Adventures of Santa Claus, and A Kidnapped Santa Claus). I was trying to get into the proper frame of mind for my Christmas short story, but eventually admitted to myself that it just wasn't going to get written this year. The good news is that I have about a thousand words of thoughts about one for next year, should I choose to pursue it. On to the next metric! Which author was most consumed by me? There were no outliers this year again. I read no more than three of any author's books, and had 42 distinct authors on my list. 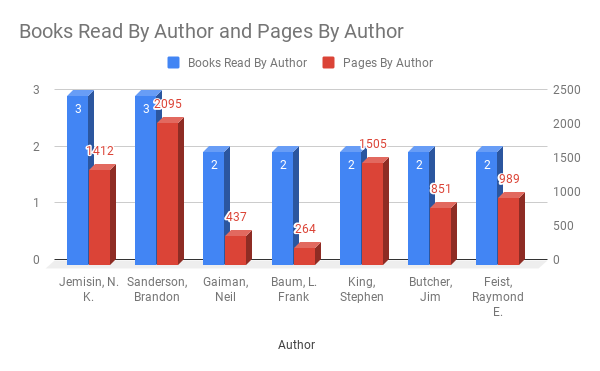 Given that there was no clear "winner" here, I thought it might be interesting to see how many pages were included in each author's sum. As you can see, I read more Sanderson than anyone else, as he writes nothing but long books (which isn't true, but I only read his long ones). N.K, Jemisin's Broken Earth trilogy, starting with The Fifth Season, is what put her in first place for me this year. Those three books won her three Hugo awards in a row, a feat which has never been done before. You should DEFINITELY go read them. They are pretty fantastic, and I don't want to spoil any of it for you. Finally, the question of how I consumed the books needs to be answered. I dispensed with the difference between Paperback and Hardcover this year, since I read so few physical books at all. The preponderance of my reading happens during workouts, via the Audible app. If you have a commute or other mindless task time and don't have Audible, you might consider it. And that was my year in books! As with last year, if you're a Goodreads type person and we're not hooked up, you can get in touch with me on that site via this link. I've entered next year's challenge as well, but I've set the goal REALLY low: 25 books. I'm curious about my December this year. I've rationalized it away as reading a bunch of short books as a function of Christmas spirit/research, but I wonder if at some level I crammed more shorter books in there because of the silly goal? I hope that's not the case, but I wouldn't put it past my subconscious. It's pretty competitive, after all. In any case, with a limit as low as 25, I'm sure to make it, and might change the metrics altogether next year. Maybe group by genre, and list most and least impactful books. WHO KNOWS WHAT WILL HAPPEN?! I guess you'll have to stay tuned. Or make a reminder to check in again next year.